The website Index Pages have now been extended to cover all of the major sections, Resources, Blog, Projects and Photos and can be found on the drop-down menu under each section. Now that there is more content on the site this addition should make it easier to find the specific content that you are looking for. This has no impact on the existing ways to find content; Menu, Search, Recent Posts, Tag Cloud or Category. 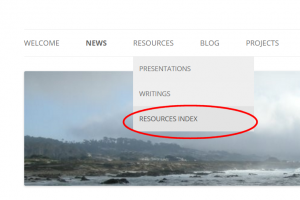 To enable this change the Resources Index page has been renamed, from ‘Index’ to ‘Resources Index‘, and you will need to update any saved link as the slug has been changed. This entry was posted in News on 11th January 2016 by admin.